The Prism TV Lift Cabinet by ImportAdvantage showcases sleek lines and exquisitely unique detailing. Finished in a rich espresso color, highlighting the qualities of the wood’s natural grain, the Prism offers flip-down panels on the front and back. 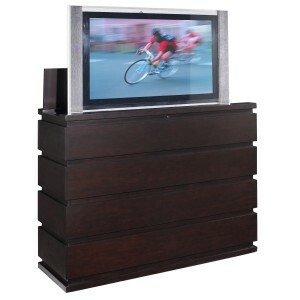 This unique feature allows the Prism to serve at the foot of the bed or against a wall, while still allowing full access to AV components or storage areas. The Prism is so versatile it can be used for small spaces, as a room divider, for large or small offices or in nearly any room in the house. It will hold flat-panel TVs up to 49 ¾” wide and 28” tall, and it comes with the Uplift 3250 lift system pre-installed, as well as the built-in Infrared Relay System. The Prism is built from Alder wood with a cherry veneer and espresso-colored finished. It can accommodate a wide variety of home styles and color schemes. Take a moment to check out the Prism TV Lift Cabinet or any of the other fine TV lift cabinets from ImportAdvantage.